Cooper, Liam, Mick, Zac, Marnold & myself are off to Barcelona today to ride for ten days. Stewart Munro is also coming along to film all the action. We will also be doing a 5 day trip through the south of France with our boys from Unleaded. Hit the guys up at Unleaded for more info on the France trip. Expect some updates whilst on the trip. Can’t wait to session iconic spots like this below & find our own gems along the way. 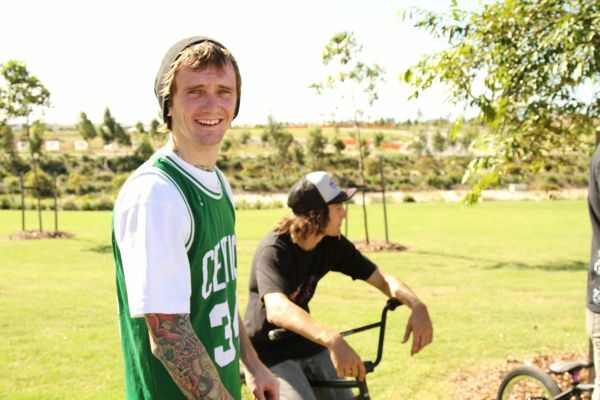 Simon O’Brien won round two of the Flatland Down Underground Series happening across Australia at the moment, this round was held in Sydney and Simon said it was a really good comp which was well organised. Simon also recently released his flatland DVD titled Dejavu, you can check out the trailor here and a review of it here. 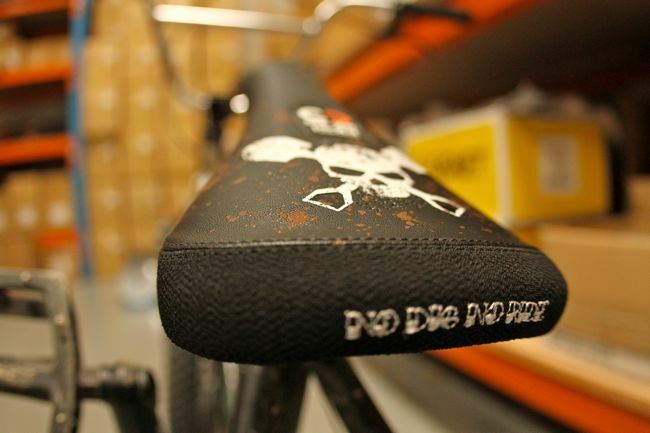 Here is the first sneak shot of our new ‘Cee’ seat design. These will be available in our new seat/post combo style. You will also be able to get them as a Pivotal design in both super slim & mid shapes. The seat/post combo will be a very light weight, comfortable & inexpensive alternative to the pivotal style seats available. Expect them all out September this year. Know the team – Peta Shepherd. I just finished work… Chilling out for a bit and then going for a ride somewhere. Any plans to travel any time soon? Hopefully yes. I wanna hit up the states in September/Octoberish. If someone asked you why they should come visit Brisbane, what would you say? Non rider: Beaches and theme parks. Rider: All the cool people to ride with and the good parks, plus the weather. How many other girl riders are there in Australia do you think? Umm.. not to sure in Australia, though I know there is a hand full in Brisbane and more keep popping up. Which is awesome to see. 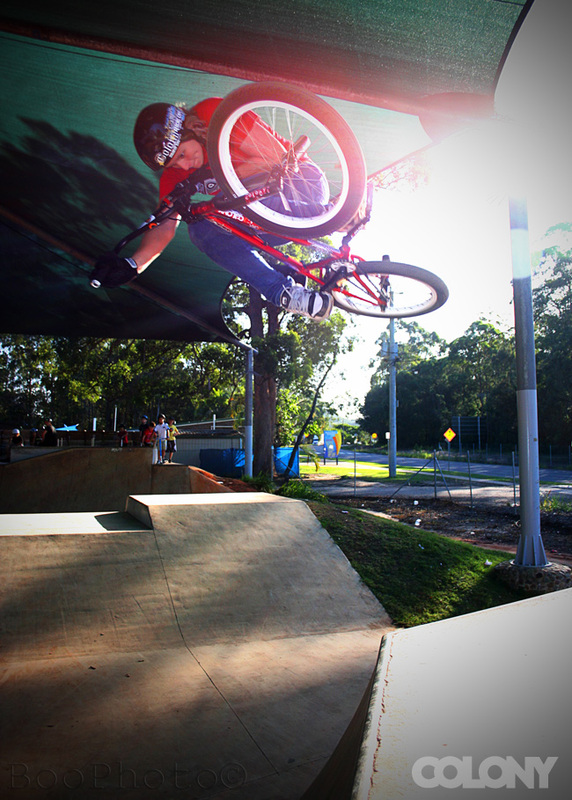 Out of the hundreds of parks there are in Queensland what is your favorite to ride and why? The guys over at Above All BMX are having a Colony giveaway on their site. Click here now for the details. Get on it !! Oh yeah, click here now to check out Chris Courtenay’s new bio on our site. 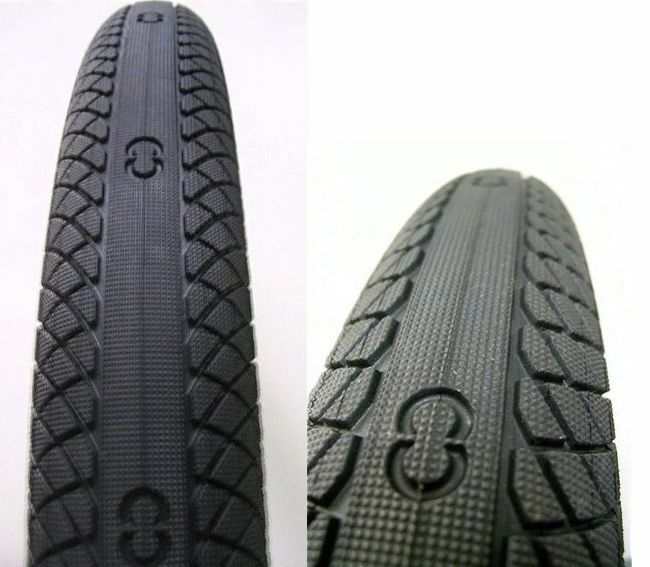 Here is another photo showing some more detail of our Agenda tyre due out later this year. More info to be released soon. Then get in touch with Tim Wood. Not only can he blast a vert ramp higher than most, he also builds amazing ramps & can do so for you too. Check out the Focalpoint winter edit below… yeah !! I am pleased to offer the initial look at our first tyre, the Agenda. These will be out late this year & will come in two versions, folding & non folding. 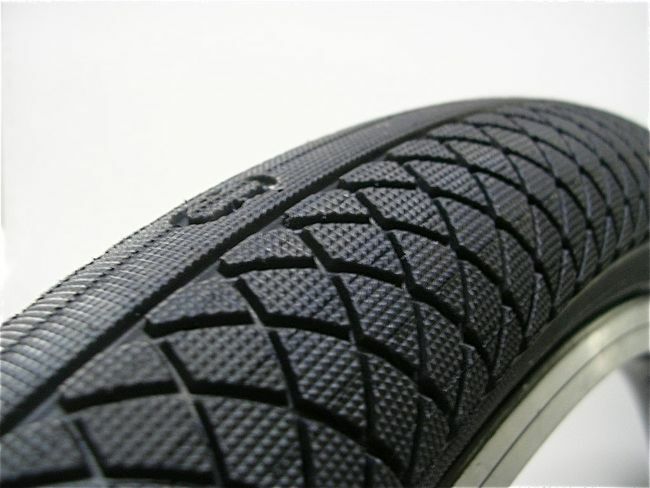 Faster rolling & longer wear in the centre with great grip on the outer sections. More info will be released in the weeks ahead. Ools from Strictly BMX did up a little iPhone holiday edit from a trip up to the Gold Coast earlier this year. Not the best quality but worth checking out. Look out for clips of Strictly team rider, Mick Bayzand & a little of Alex in the mix. 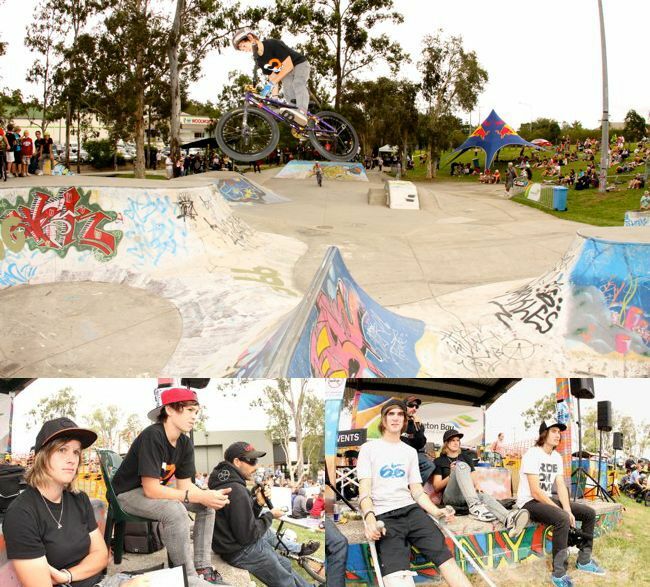 The second event in the Core Series went down yesterday at Albany Creek skate park with a huge turnout which was great to see. Plenty of good riding went down & you can check for full results by clicking here now. Peta Shepherd was the only Colony rider who entered but she did well in the expert class with a few first’s for her. Alex wasn’t feeling it & pulled out before the pro class began. Chris turned up fresh from his knee surgery to watch & was in good spirits. Tim was on the mic as usual & kept things rolling along. All in all, a good day was had by all. 17 months ago we lost a good friend in the Victorian bushfires, Nathan Charles. Unfortunately I couldn’t make it to this years jam but Colony hooked up the guys with some product to give out on the day and going off this video there was a good turn out which is awesome. Pete Radivo took it pretty hard near the end of the edit, I have no idea what Pete was trying. Rest in Peace Charlzy. Bruno Faucon Edit… & a France trip? Bruno sent us over this edit which he features in, that park at the start looks super fun. Look out for a quick clip of Libellule as well. See you both next month !! By the way, we will be in the south of France mid June touring around with a bunch of the team from Australia as well as our French connection. Check with Unleaded for more info & dates. We will also release full details here in the next few days. This has nothing to do with Colony what so ever but it’s just too crazy not to post. So original. Check it out now. It’s been a very relaxing week but time to say bye to Tokyo… Brisbane here we come !! This was the view from our hotel breakfast each morning. Zac has scored himself the next spot on our splash page for our site. 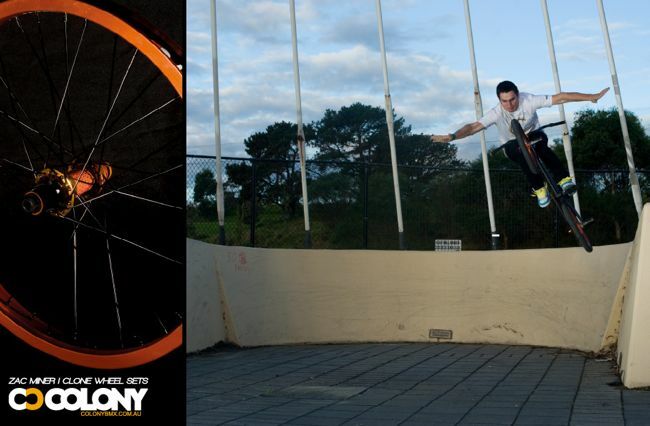 Shot at the classic spot in Sydney which was actually Zac’s first time to ride there. Such a fun little spot. 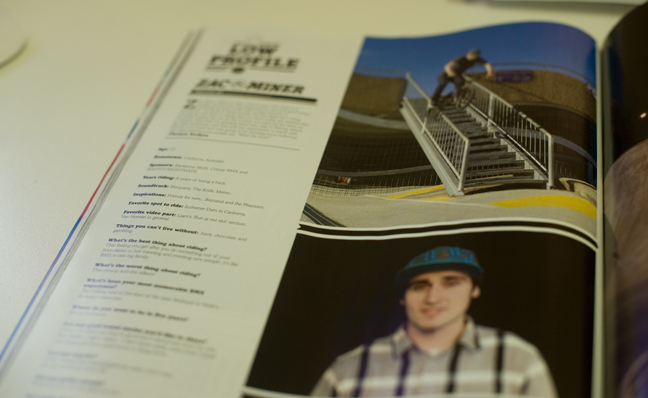 Zac Miner has a Low Profile in the latest issue of DIG BMX magazine. DIG is definitely my favourite BMX mag and this issue is no let down. Tom Stretton is the man. Random photo whilst out riding a few weeks back. Word. I am in Japan this week for holidays & it’s awesome. Such a different place & so much fun. 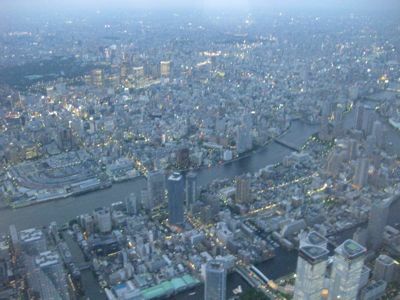 We went on a helicopter flight over Tokyo which was awesome also had dinner & drinks with Shoe-G at his house with family. Tonight we had drinks & dinner with Shintaro, good times. 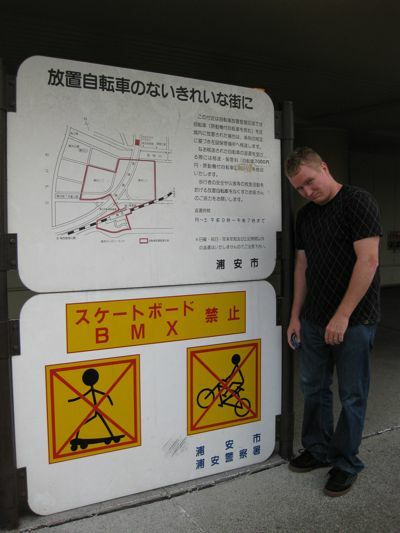 We also spotted this sign that said no BMX, it made me sad, haha. 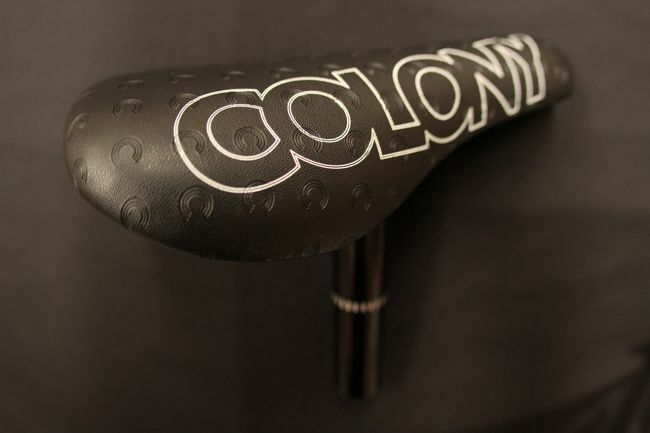 Introducing our first team rider colab product. 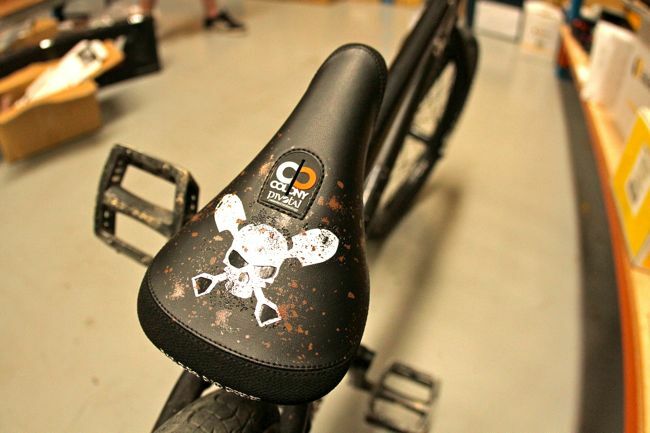 Ryan Guettler & Nick Richardson came up with this seat design together to make our first joint signature product. Trails inspired these will be offered in our 2011 product range in our super slim shape as well as our new mid shape. Expect them available September this year around the world. Our flow rider from Hungary Attila Godi sent over this recent edit. The park it is filmed at looks pretty interesting it’s almost like it’s someones backyard, random tent midway through the section in the background aswell, either way some cool stuff in this. 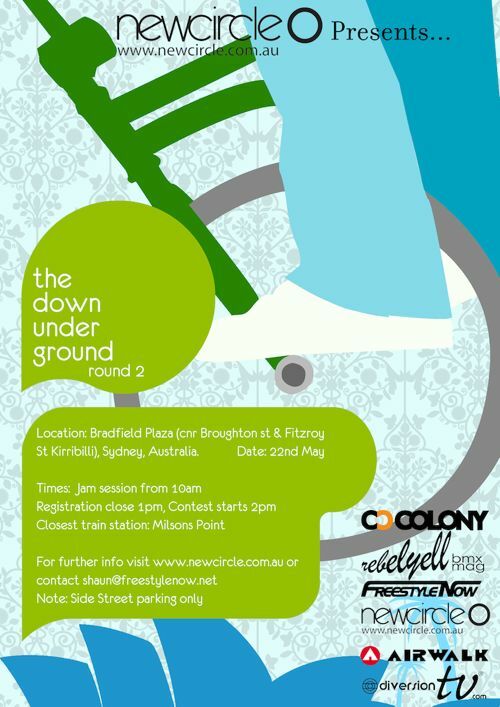 … is the next round of the Down Under Ground flatland series of comps. If you’re in Sydney get yourself to it to see what the Australian flatland scene has to offer. 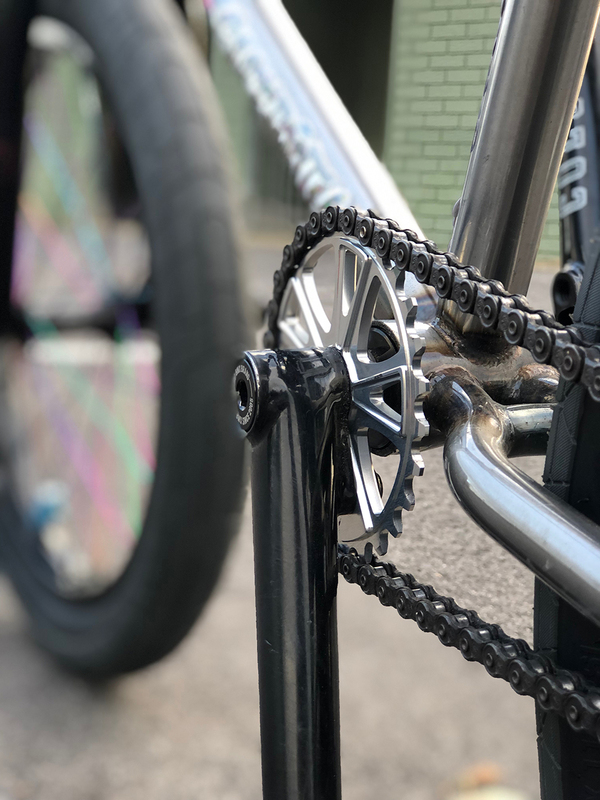 We are pleased to announce that the inaugural Colony BMX Street Jam will be held at this year’s Ausbike show in Melbourne on Saturday August the 21st. There will also be a second event to be held at the Brisbane show on the 9th & 10th October, 2010. 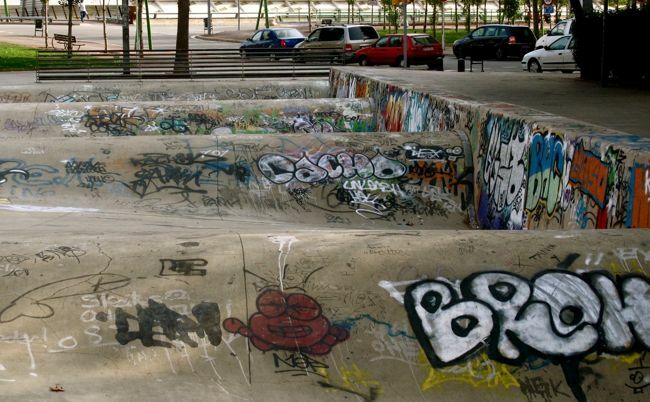 There will be a purpose built ghetto style street course for both events for riders to get creative on. These two events will be strictly invite only & the 20 invitees will be announced closer to the event. You can expect the best of the best of Australian riders to be present. There will also be prize money up for grabs as well. Check both our site here & the Ausbike site for more info closer to the events.